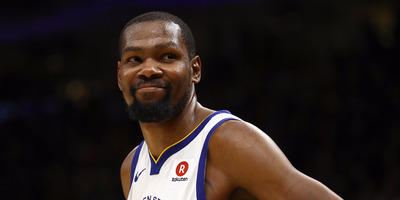 Kevin Durant delivered a masterful performance on Wednesday, scoring 43 points in Game 3 of the NBA Finals on Wednesday to put the Golden State Warriors up 3-0 over the Cleveland Cavaliers. Durant’s performance summed up why he’s made the Warriors so dominant. Stephen Curry and Klay Thompson struggled badly in Game 3, and the Cavs played well – but Durant was on another level, and Cleveland had no answer. In Kevin Durant’s two years with the Golden State Warriors, there may not be a better example of the lift he has provided the team than Game 3 of the NBA Finals on Wednesday. The 43 points Durant scored on 15-of-23 shooting – to go along with 13 rebounds and seven assists – did not come on easy shots; Durant just made them look easy. Cleveland Cavaliers players draped themselves all over Durant. They sensed when he was dancing into shots and stuck their hands straight up, only for Durant to rise a little higher and make the shot over them. They knew where Durant was trying to get to and when he would pull up, but their contests didn’t matter. Durant stuck shots from all locations and angles, against all types of defenders. The result was one of the greatest, most lethal, and most efficient Finals games in NBA history. Durant put the Warriors on his back to give them a 110-102 win over the Cavaliers, pushing their series lead to 3-0 and putting the Cavs’ season on the brink. It came on a night when no other Warriors player got it going offensively. Who would have guessed that on a night when JaVale McGee and Jordan Bell were some of the Warriors’ best offensive options that the Warriors would win by eight? All while LeBron James put in his now standard triple-double, with Kevin Love pitching in 20 points and Rodney Hood scoring an unlikely 15 off the bench. With the game hanging in the balance, Durant delivered an all-time, ice-in-his-veins pull-up three-pointer to effectively end the Cavs’ season. The shot resembled the dagger three-pointer he hit in Game 3 of last year’s Finals. It was from the same location, in a similar scenario, and it also put the Warriors up 3-0. What Durant brings to the Warriors has been obvious since he chose to sign there in 2016. He can get easy shots as a result of the attention that defences pay Curry and Thompson. He can attack closeouts against scrambling defences and get his teammates easy baskets when the tables turn. But when the Warriors’ system fails, Durant is the lifeboat – one they didn’t have in 2015 and 2016, when the offence revolved around Curry. Durant can create shots out of nothing and make it look routine. Steve Kerr called Durant the ultimate luxury earlier in the postseason. When the Warriors’ offence breaks down, that they can throw it to Durant and tell him to do something is an incredible plan B. This is the benefit Durant provides the Warriors. Curry and Thompson can slog through arguably the worst Finals games of their careers, and it won’t matter. If Durant by himself is firing on all cylinders, the Warriors are still too much for any team to handle.